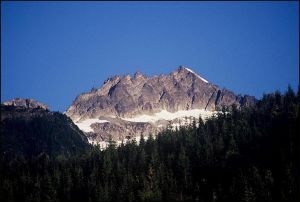 A prominent, glaciated summit on the east side of Harrison Lake. Considering its close proximity to Vancouver and the fact it dominates the view along the lakeshore, it receives relatively infrequent ascents. A series of fault-like ridges in the bedrock SW of the summit icefields of Breakenridge, overlooking the lake, have been investigated by geologists over the years. These are believed to be the upper tension cracks of a large mass of rock of dubious stability. The possibility exists that a catastrophic rock avalanche on the scale of the Hope Slide could enter the lake and create a pseudo-tsunami with enough power to seriously damage the village of Harrison Hot Springs. The exact possibility of such an occurrence taking place is generally thought to be low, but not non-existent. Mt Breakenridge is a stunningly good ski peak. Road access is generally possible all year, but anticipate difficulty immediately after large snowfalls. The Harrison East road is largely low elevation and services year round logging camps at Cogburn (Bear Creek camp) and Silver creeks (Silver River camp). As the area receives heavy snowfall, it is possible to have excellent skiing right into June. In June 2002, for example, the road was still snowed-in down to 2500ft. Above the top of the logging, wide-open timber leads to a series of small, subalpine lakes and a final wide gully leading to a 7200ft col, 1km west of the summit. Name Notes: Named after Sapper Archibald T. Breakenridge, RE, who was with Lieutenant Palmer's party making a reconnaissance survey from the north end of Harrison Lake to Four Mile House on Lillooet River, in 1859. (Accounts & Papers, Colonies, 1860, Vol XLIV ).